Soil erosion is considered to be one of the most serious forms of soil degradation. The richness and fertility of soil makes it one of the world's most valuable resources. Soil is the main resource upon which agricultural and food production depends, so it needs to be managed well. Soil erosion is considered to be one of the most serious forms of soil degradation. It is widespread and irreversible. Although weathering and erosion are natural and important processes, human activities often accelerate the movement and loss of valuable soil. 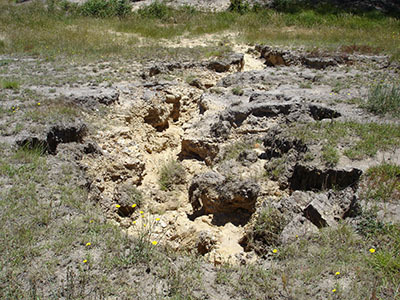 Soil erosion occurs when soils are exposed to the forces of water, wind and gravity. When vegetation cover is cleared, or lost due to over stocking or over cultivation, the force of the wind on the soil surface increases, causing erosion. The same soil surface exposed to falling raindrops and run-off is also vulnerable to erosion from water. Sodic soils are extremely vulnerable to erosive forces and require special management. Erosion reduces fertility and productivity, stripping the soil of valuable nutrients and minerals. There are five major forms of erosion: sheet, rill, gully, stream bank and tunnel erosion. The most stable situation to prevent any form of erosion is to maintain a continuous and resilient cover of vegetation over the soil surface. Erosion has many impacts, particularly for farmers and landowners. It reduces fertility and productivity, stripping the soil of valuable nutrients and minerals. Lost soil becomes entrained in run-off, often choking and polluting waterways, and damaging public utilities. 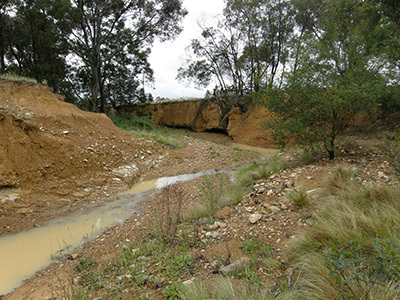 Treating existing erosion, particularly gully and stream bank erosion, can be costly. All landowners should seek specialist advice about minimising, controlling and treating erosion. Maintain between 80 and 100 percent groundcover vegetation of mostly native perennial grasses. Learn about the qualities and properties of soil on your property - undertake a LANDSCAN course available through the Department of Primary Industries. Seek advice about treating and preventing erosion - see links below. Use fences to control or prevent stock access to gullies, waterways and riparian areas. Consider using alternative troughs to water stock. Revegetate exposed soil with perennial grass species.